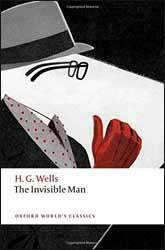 The Invisible Man (1897, new imprint 2017, 143 pages) is another of H. G. Wells most popular novellas. Unlike some of his other stories, he subtitled the story, A Grotesque Romance. The story opens with a stranger’s arrival at an inn in a small hamlet. His manner is brusque, but his gold is good so the landlady makes him up a room. As the evening progresses they become more curious about their new arrival who seems to have been in an accident given that he is covered in bandages. It’s been some while since I first read the story and rereading it now I am struck with the parallels with Mary Shelley’s Frankenstein (1818). Both Shelly’s creature and the invisible man draw the hysterical ire of people just because they are different. The Invisible Man may have stolen some money to survive but the reaction is more akin to that of a child murderer. Hounded, he finds refuge with an old college acquaintance and here we discover that as an albino and a social outcast for his looks, he was invisible all his life, an object of both fascination and revulsion. It certainly leaps off the page, for the modern reader but personally I would be more uncomfortable with historical revisionism, we have enough Newspeak in the real world without starting to edit the past. That said Oxford University Press has done another sterling job with the book's presentation. There is an introduction which discusses the merits and cultural impact of the story. Notes on the Text discusses how the story was put together. Wells's work invariably appeared like Dickens's work as a serial, although it's less obvious with Wells, as there are fewer story climaxes to show where the original text was demarcated. They were then printed as novellas in America with Wells continually revising the text. We get a repeat of the Chronology of Wells his work and life which appear in all the novellas. For those that want to dig a little deeper into the text there is a selected Bibliography. The book closes with two appendices which cover some of the alternative endings and Explanatory Notes for the annotations found throughout the text.